Libya stands on the verge of a renewed civil war. Tripoli could be sacked by rebel forces loyal to renegade General Khalifa Hifter. From an energy perspective, 300,000 to 400,000 million barrels of oil supply are at risk. Forces loyal to Libya's UN-backed unity government arrive in Tajura, a coastal suburb of the Libyan capital Tripoli, on April 6, 2019, from their base in Misrata. DUBAI — A resurgence in fighting around the Libyan capital of Tripoli this week has driven U.S. forces to pull out of the country and is providing a new upside risk to global oil prices, underscoring the OPEC producer's importance to markets and the fragility of its supply. Rebel forces loyal to renegade General Khalifa Hifter, who effectively controls the country's breakaway east, launched a surprise offensive against the home of Libya's UN-recognized government last week in a move that risks plunging the country back into civil war. "The Libyan conflict coming back onto the front of the mind of the marketplace is actually very significant right now," Dave Ernsberger, global head of energy at S&P Global Platts, told CNBC in Dubai on Monday. "We've seen Venezuelan production fall of a cliff, we've seen already inventories against the five-year average move into more bullish levels, so the fact that there might be a lack of Libyan supply to the market is potentially a bit of a shock right now." The North African country of 6.4 million has been struggling to rebuild its energy industry since its 2011 revolution that ousted longtime leader Moammar Gadhafi and the ensuing collapse in central power. 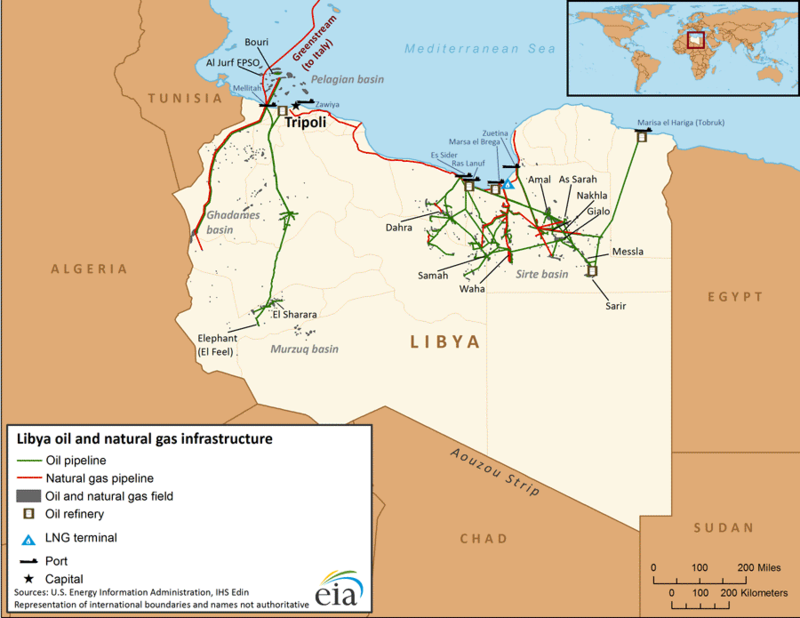 The territory under control of Hifter and his amalgamation of militias who call themselves the Libyan National Army (LNA) includes the "oil crescent" in the Gulf of Sirte that holds four major ports, comprising the lion's share of Libya's oil exports. Hifter's attempts to take control in the west could leave the oil-rich east vulnerable to his rivals; the general is credited with securing many of Libya's central export terminals after battles with the Islamic State and other extremist groups in recent years. "The immediate barrels under threat would be those from the southwest which come up through into the west of the country, so that would be El Shahara field, a good 300,000, maybe up to 400,000 at immediate risk," said Paul Horsnell, global head of commodities at Standard Chartered. "But it's the uncertainty of those supplies rather than the immediate changes in the flow," he said, that will impact markets. Oil output disruption depends very much on how the fighting around Tripoli evolves, and whether a planned conference on new elections and reconciliation can still take place. The UN's envoy to Libya is so far insisting that the conference will go ahead. Retired Libyan Army general Khalifa Haftar speaks during a press conference in the town of Abyar, 70 km southwest of Bengahzi, on May 17, 2014. "If you did lose that supply out of Libya right now, or a portion of it, most of the market would view it as being temporary as we've seen over the course of the last several years," Jeff Currie, global head of commodities at Goldman Sachs, told CNBC's Dan Murphy on Monday. "So it would create and reinforce a spot price move to the upside and that $75 potential-plus range, but it wouldn't do anything at the back end," Currie said, which he sees at $60. Exempt from OPEC's supply cut agreements due to its civil conflict, Libya was enjoying its highest output levels in five years in the latter half of 2018. Production reached 1.28 million bpd as reported in November, up from roughly 500,000 bpd the previous June, but slipped to 900,000 bpd in February, according to OPEC. Libya in the 1970s was pumping 3 million bpd. Before the 2011 NATO intervention that helped oust Muammar Gaddafi, it was producing 1.6 million bpd. The country's population sits above the largest proven oil reserves in Africa, but benefit practically nothing from them — the UN estimates about 40 percent of the country lives below the poverty line. This year, Haftar's LNA forces have already sought to bring order to the restive southern oil-producing region. But a campaign to take Tripoli could be even more grueling, analysts say, with some predicting prolonged and heavy fighting near the capital thanks to better-organized militias in the country's west. The latest supply disruption has been brewing for some time, serving as a reminder that the country's fragile recovery shouldn't be taken for granted. "It's not new, but there is a significant escalation," Standard Chartered's Horsnell said. "I think the market hasn't concentrated on Libya as much as it perhaps should've done. At the moment we do see threat to Libyan supplies in the short and medium term." Libya is a key supplier of light sweet crude, which can actually be replaced with supplies from the U.S., Ernsberger said. But while he described this type of crude as still relatively available, "it's nevertheless a bit of a shock." "I think traders and particularly consumers of crude oil in the market are starting to realize that actually, with OPEC potentially extending its production cuts into back of the year and beyond, these short term disruptions are having an outsize impact on the price of oil and might continue to do so if that agreement gets rolled forward," he said. This comes on top of supplies being taken off the market in Iran due to U.S. sanctions and in conflict-ridden Venezuela. Libya's conflict "certainly moves any forecast to the upside, and potentially beyond that as well — it's a significant issue to re-calibrate forecasts on, for sure," Ernsberger said. "It's a significant event in and of its own right." —CNBC's Tom DiChristopher contributed to this report.